Resume writers o ften overlook resume writing principles, which hiring managers are very keen about. As defined by the Human Resource department, a resume is a marketing profile that contains vital and precise information about the applicant or job candidate. Whenever hiring managers observe resume mistakes like informal e-mail addresses with sexual or racial references written all over it, they immediately throw the resume or shred it into pieces. 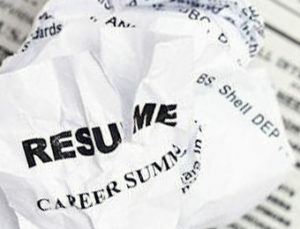 Inexperienced resume writers are the bottom feeders of today’s job application hurdle. These people do not know what they are talking about nor do they have direction when writing their personal portfolios. First time resume writers are forgiven; however, seasoned workforce veterans must never try to include e-mail addresses that connotes sexual, racial, or religious tendencies. Hiring managers want formal e-mail addresses and applicants must strictly comply. Inexperienced resume writers include friends as potential sources of professional recommendation to hiring managers. Of course, these people will think of you as a qualified candidate for the job. Just make sure your friends do not apply in the same company that you are trying to impress. Twitter, Facebook, LinkedIn, and Multiply accounts are an inexperienced resume writers’ deathtrap. Never include links pointing to your social media accounts, because hiring managers are not in the mood to ‘Like’ something in the middle of the screening process. If you come in at the interview with your hair bouncing with vigor, then you have a chance. If you submit a resume with curls of text explaining your qualification, then the hiring manager just stabbed you in the back. Use conventional text formats. Hiring managers know when an applicant is telling the truth. “Forcefully motivated employees to rigorously finish their job with flying colors” may raise an eyebrow. Powerful and precise statements work, but lies trembling with fictitious achievements wont. Finally, resumes that introduce the applicant’s family tree and 20 plus year journey will never make it. Inexperienced resume writers exhibit their foolishness through such lengthy and exasperating personal introductions.